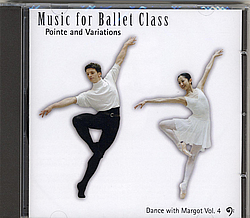 CD with music for ballet classes. Vol. 4 has 52 tracks covering a complete class including music for Pointe work and 16 ballet variations from Coppélia, Swan Lake, Giselle, Sleeping Beauty, and La Bayadere.